Bluegrass sang with direct and concrete imagery of lives lived closer to the earth—and closer to the edge. Homer would have understood. 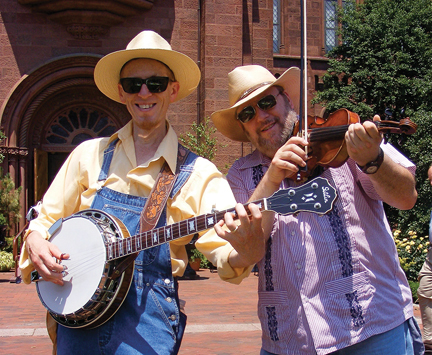 Ira Gitlin (left, with banjo) walked away from a doctoral program in classical studies to pursue his true passion—bluegrass music. One observer said that people come to bluegrass for the music, but they stay for the community. IN MY SECOND YEAR OF GRAD SCHOOL, THE RIVER RAN DRY. 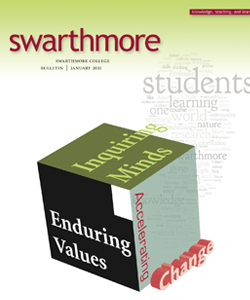 With a degree in ancient Greek and no clear plans for life after Swarthmore, I’d been relieved when the University of Pennsylvania offered me a fellowship for their doctoral program in classical studies. Because I enjoyed studying the languages, history, and literature of the ancient world, it had seemed like a good idea at the time. But after a year or so it became clear to me that I simply didn’t have the drive to become a professional scholar and deep down I didn’t understand the ways of academia. I left Penn with a master’s degree, but in my heart I knew I was a dropout. While the scholarly flow dwindled to a trickle, however, another stream was gathering force. I’d started to play guitar in the fifth grade and taught myself banjo in high school. My tastes were eclectic—they included folk, jazz, and classical music—but bluegrass grabbed me hardest. Bluegrass, a supercharged 20th-century offshoot of the string-band music of the southeastern United States, got its start in 1945 when Grand Ole Opry member Bill Monroe (1911–1996) added the intricate banjo playing of Earl Scruggs (b. 1924) to his band, the Blue Grass Boys. Its blend of innovation and tradition was initially popular among rural, white, working-class southerners, but by 1960 it was gaining popularity in northern cities and on college campuses, thanks especially to the efforts of folk-music revivalists such as Roger Abrahams ’55 and the late Ralph Rinzler ’56. So I was delighted to discover, when I arrived at Swarthmore, that there were bluegrass enthusiasts there. As a freshman, I idolized Robby George and Friends—a student group led by banjo player and singer Robert George ’77 that played a mix of bluegrass, folk, and country rock. In my sophomore year, after Robby and most of his band had graduated, I and a few friends formed the group Corduroy Road, inheriting much of Robby’s repertoire and audience. But beyond that formal parallel lay a more expansive vista. Bluegrass offered me a glimpse into a world that was alien to my urban, middle-class, educated upbringing. It sang, with direct and concrete imagery, of life lived closer to the earth, and closer to the edge; of wanderers torn between their longing for the comfort of home and their desire for adventure; of lovers separated by fate; of family and contentment, faith and pride, loneliness and desperation. Homer would have understood. In the years since, I’ve developed a reputation in local bluegrass and roots-music circles as a dependable and versatile banjo, guitar, and bass player. Most of my performances are close to home, but I get to make occasional forays farther afield, including two State Department tours that have taken me to Eastern Europe, Central Asia, and Africa. I’ve also discovered within myself a talent for sharing my musical understanding with others. Teaching—in private lessons, music camps, and workshops—has become an important part of my professional identity, along with writing for niche publications like Bluegrass Unlimited and Banjo NewsLetter. Music making has thrown me together with people of all ages, backgrounds, occupations, and beliefs. I don’t think I could have encountered such an assortment of unlikely characters in any other line of work: There’s a Japanese mandolinist whose English can barely be understood but who conveys his sense of humor through his music; a Harvard-educated virtuoso who quit a career in investment banking to tour with a top band, then went on to found a successful record company; a slow-talking, guitar-picking good ol’ boy who is a self-taught translator of ancient Anglo-Saxon literature; a fiddle-playing Federal employee who distills corn liquor in his Capital Hill row house. I’m linked to these people by more than just a love of the music. We’re all participants in the culture that has grown up around bluegrass. Artistically it’s a meritocracy that reveres its founders and rewards its great musicians, but socially it’s a democracy where fans and performers mingle freely. The bluegrass nation is like a small town, with no more than two or three degrees of separation between any two of its citizens anywhere in the world. Many fans are also amateur musicians, and impromptu jam sessions are a regular part of our lives, especially at the summer festivals that anchor the bluegrass calendar. People come to bluegrass for the music, as one observer pointed out, but they stay for the community. Flying in the face of bluegrass’ down-home image, some devotees bring an intellectual perspective to bear on the music they love. It’s in this niche-within-a-niche that I often feel most at home. A few of these folks are professional academics, but most are what once would have been termed “gentleman scholars.” Fans seeking to understand the music’s development chronicle the incestuous reshufflings of band personnel. The appreciation of fine instruments leads some collectors to delve into the minutiae of decades-old factory shipping ledgers. Lu-thiers chase down their tonal ideals by tabulating wood densities, resonant frequencies, and other acoustic data. Among the papers delivered at the world’s first symposium on bluegrass music, held in 2005, were offerings in musicology, history, theology, demographics, sociology, and even cosmogony. (My own paper at that event discussed the evolution of common repertoire heard in jam sessions; see ww.iragitlin.com/writing-samples/the-parking-lot-vernacular). It’s been a varied and colorful livelihood. In my musical travels, I’ve eaten elk in the mountains of New Mexico, camel on the edges of the Sahara, and improbable gourmet meals whipped up over a Pennsylvania campfire. I’ve tasted fermented mare’s milk in Kyrgyzstan, canned sake in Kentucky, and moonshine in too many places to count. 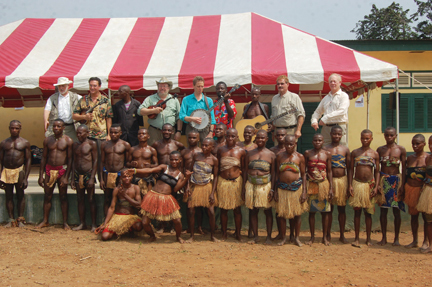 I’ve found myself jamming with pygmies in the rain forests along the Oubangui River in Central Africa, driving a 35-foot bus through South Carolina after scant minutes of instruction in a truck-stop parking lot, and lecturing at the Smithsonian Institution despite a complete lack of relevant academic credentials. Perhaps best of all, I’ve had the privilege of performing on stage with many of my musical heroes—if not the Homers of bluegrass, then at least its Hesiods, Sapphos, and Aristotles. In one of the most moving bluegrass songs “Tall Pines,” trees provide a metaphor for the unpredictable course of human life. The singer recalls how the seedlings he’d planted in his youth failed to thrive. But when he returns home after many years, he sees that they’ve grown, just as he has: “Tall pines, tall pines, reaching up for the clouds/Tall pines, tall pines, I bet you wouldn’t know me now.” Homer would have understood. Ira Gitlin ’80 has made a place for himself as an instrumentalist, music teacher, and writer since moving to Washington, D.C., to take advantage of its vibrant bluegrass scene in 1986. Along the way, he’s racked up a National Bluegrass Banjo Championship (1992) and a shelf full of “Wammies” from the Washington Area Music Association. Listen to Ira Gitlin’s music at www.iragitlin.com. Great article, thanx for sharing. The music really is a special place - it has brought me enjoyment, relaxation, challenges and several friendships with special people that I might not have otherwise come to know. You do indeed have a gift and those of us fortunate enough to benefit very much appreciate it.